"I get things are bad, but what are we doing to fix it?" Filmed all over British Columbia, Tomorrowland aims to be family friendly, PG action adventure wrapped in Disney's trademark branding, theme park mythology building, and idealistic spirit celebrating imagination. Instead, animator/filmmaker Brad Bird has crafted a rather glossy but very messy film full of simplistic yet bright ideas and no real story or mystery. It trades a sense of wonder and hope for a narratively unfocused journey to nowhere. Scripted by Bird and Lost co-creator Damon Lindelof, the film's themes are a heavy-handed message against cynicism and our collective inability to solve global problems, instead accepting our doomed fates and self-fulfilling prophecy of defeatist thinking. There's a ton of prophecy exposition expelling the virtue and genius of characters and ideas that never pay off. None of the magical realism is ever explained, nor is the movement of our characters' motivations as they go from one setting to another without any reason. Tomorrowland follows the road trip/buddy chase movie formula despite never making clear who they're being chased by or why. 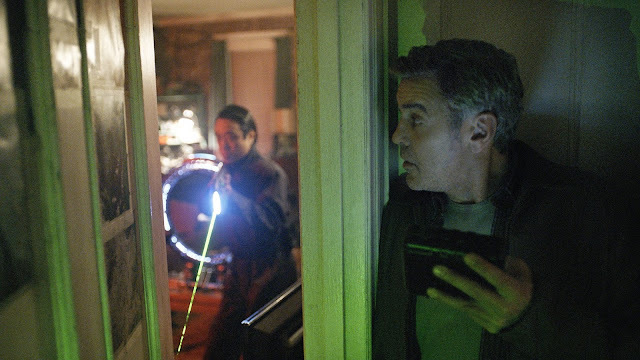 Even the dual charm of George Clooney, sadly relegated to being a grizzled, cranky inventor, and lead Britt Robertson can't save the meandering plot devices and journey towards a magical land of retro futuristic promise that never lives up to the hype. Our leads are also unfortunately saddled with some annoying narration to bookend the film that's emblematic of its overall story problems. English actress Raffey Cassidy is a standout in a losing effort as a mysterious child recruiter while Hugh Laurie is largely wasted as an antagonist and leader figure sans any character development of his own. All of Bird's talent and vision are unable to overcome Tomorrowland's many narrative missteps and carry the adventure forward in any meaningful way. An unexplained premise and magical journey masquerade for mystery and unfulfilled optimism. While Bird and Lindelof's collective ideas and scope are undoubtedly grand, the realization of their vision is narrow and unfocused despite some dazzling visuals as we never go beyond the actual small world we follow. It fails to earn the optimistic tone it sets out to fulfill.